This paper discusses the implications of the tragedy series that have general developed strategies in the communities in Papua and how the communities responded the tragedy. Along with the memories of the violence and how they have been suffering by the tragedy, there was also a “culture” to remind “silent”—afraid to bear witness. The communities became a muted group. The culture of the silences also grew in the education matter. Materials in formal education in Indonesia somehow fail to recognize the tragedy series that happened to the people of Papua. There are many encouragements to Papuan to break the culture of silence, brave to be witnesses, educate others about the tragedy. In this paper the discussion will explore the relation between the violence that the Papuan had been experienced personally and the culture of silence that later grown and settled in their communities. 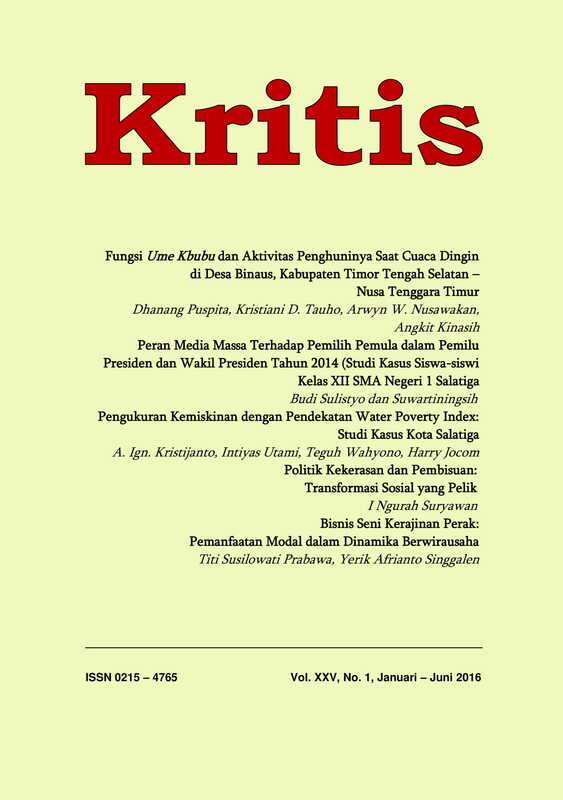 Ketika penulis menyerahkan artikelnya kepada Dewan Editor Jurnal Studi Pembangunan Interdisiplin KRITIS, dan jika artikel tersebut disetujui oleh Dewan Editor untuk diterbitkan maka HAK CIPTA dari Artikel tersebut melekat pada Jurnal Studi Pembangunan Interdisiplin KRITIS. Pihak Dewan Editor dapat memperbanyak memperbanyak Artikel tersebut dengan tetap mencantumkan nama penulis. Kritis is licensed under a Creative Commons Attribution 4.0 International License.